Ken Grace has been representing employees and their unions for his entire working life. His interest in the labor movement goes back to high school growing up in a small western Massachusetts town with two major manufacturing plants. One was unionized and the other was vehemently anti-union. To Ken, it seemed pretty simple: a union gave the workers a necessary collective voice over their workplace…yet the non-union employer always stayed one step ahead of the union shop in wages and benefits, no doubt as a method of union avoidance. It was this overall labor-management dynamic that led Ken to further his interest in employee representation. In 1982, Ken became Joe Sandulli’s first associate and they formed the partnership of Sandulli Grace in 1985. Since then, the firm has gradually grown to its present size of 12 attorneys (8 of which are partners) and 4 support staff— all collaborating together to concentrate exclusively on the best possible employee and union representation. Ken has successfully negotiated hundreds of collective bargaining agreements and has mediated countless grievances to fair resolutions. While he has litigated numerous victories in arbitration, unfair labor practice proceedings and court, he endlessly tries to take a “business agent” viewpoint to solving employment problems rather than litigation. More often than not, he feels that the outcome is better when you reach an acceptable agreement rather than have something potentially less acceptable imposed by a third party. In addition to his work for Sandulli Grace, for over 30 years Ken has taught hundreds of labor union members at the Boston Labor Guild’s School of Labor-Management Relations. 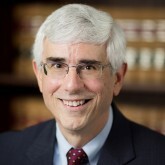 He is the recipient of the 2012 Cushing-Gavin Labor Attorney Award for excellence in labor-management relations. Ken lives in Needham with his wife Peggy who is the Assistant Director, Career Services at Simmons College. They enjoy travel, which Ken especially likes to plan, theater and biking together. Their two sons, Mike and Matt, also live in the Boston area.